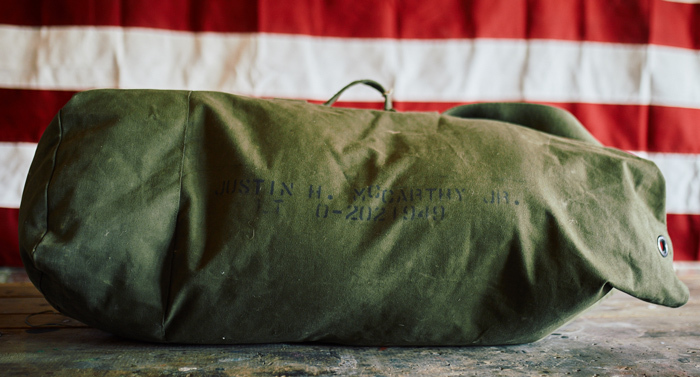 Our 32L Kit Bags are inspired by classic aviator's kit bags, which are also used by Special Forces teams to transport a small army’s worth of gear (per person). We've modernized the aviator's kit bag and added functionality not for jumping out of airplanes, but for daily use, travel, and storage. Re-designed internal Cordura pocket with enough space to fit any phone. Just imagine you’re a new recruit with an Army green duffel bag full of stuff they made you buy to start Basic Training. You show up in your bus, and you’re immediately greeted by a shark attack of Drill Sergeants. “Get off my bus," they scream, two inches from your face. Eventually, there’s a layout after you’ve carried your bag above your head for what seems like an eternity. Never finding anything unless you dump everything out. Drill Sergeants know this, and they exploit it. When you join Special Forces and other high speed units, you stop using that bag because it’s terrible and in our opinion, should be phased out.